Hi. Addon is not working for me at all. Not even pulling out materials from bank. What could be the problem? Most likely conflicts with other mods. Can't help if we don't know what those others are. You get no LUA errors at all while this not-working is happening? Because this function is not supported in Japanese, it is OFF on the code. I am a beginner, so I could not think of a collaboration. However, changing this add-on to a patch of [Lazy Writ Crafter] is attractive. Although it is impossible in a hurry, I will investigate slowly. Maybe I can help. I don't know Japanese at all, but I'm not completely lacking talent understanding LUA. If I can figure out how to rework your code as a module(s) to fit into Lazy Writ Crafter, I'll share it. Why didn't the author of these mods contact the author of LWC and propose a collaboration TO ADD THAT FUNCTIONALITY INTO LWC instead of creating competing and partially conflicting mods? Again I ask: WHY is this mod separate from Writ Crafter needed? Answer: it's not. Personally, i have absolutly no problem, no error, with those 2 new addons, they works as good as Dolgubon's. Both are a new additions to the other one. You can make an observation like that and yet STILL miss my point? Why didn't the author of these mods contact the author of LWC and propose a collaboration TO ADD THAT FUNCTIONALITY INTO LWC instead of creating competing and partially conflicting mods? Because each author do what he wants. They offer us their times and addons, and i respect their choices if they dont want to integrate or create something. They have no obligations towards me. I am grateful they share with me the addon they create. And i do not have any conflict using them together. Last edited by Anceane : 04/12/18 at 09:59 AM. Last edited by VulcanTourist : 04/12/18 at 09:15 AM. (I do my writs with 19 characters every days, ranging from lv 13 to max, with max crafter, to noob, or mix, so i craft anything). You need to recognize that there is substantial duplication of effort here. Ultimately the "solution" is to JUST PICK ONE and not use the other at all. Yes, I recognize that one may have specific features the other doesn't. That is the point at which you decide to fork one or the other and merge non-duplicate features into one derivative mod. 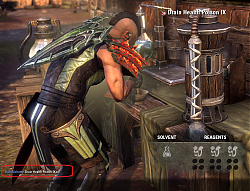 I am very close to that point with multiple mods; in particular I'm getting sick of how the new home chests are handled poorly or not at all by certain mods. 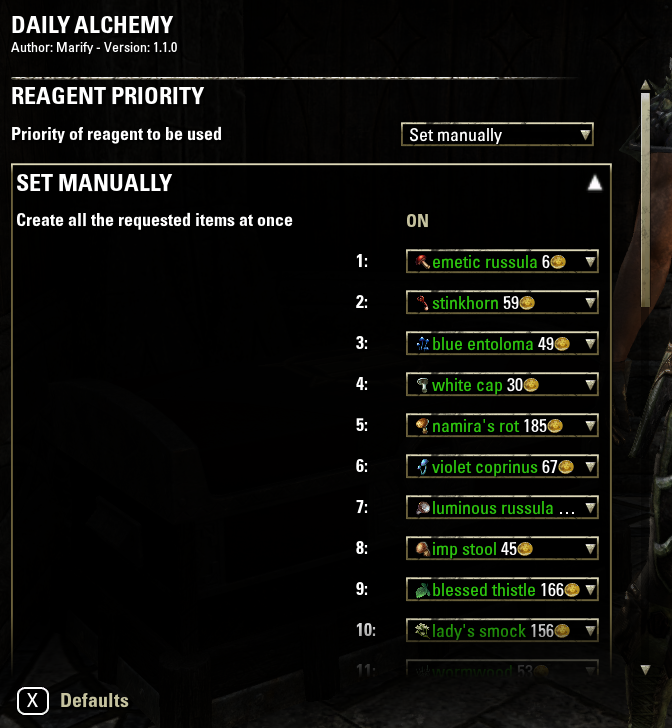 Also Zenimax needs to stop being assholes about storage in general and make the home chests accessible to the crafting stations LIKE EVERYTHING ELSE IS. Again I ask: WHY is this mod separate from Writ Crafter needed? Answer: it's not. 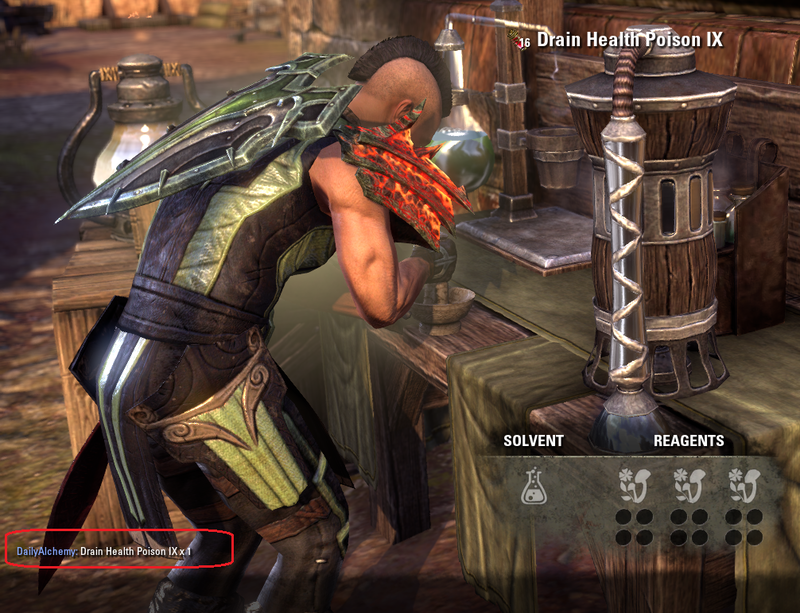 This mod should not exist, neither should Daily Provisioner. Instead of competing with another mod, the author should have been collaborating with the author of the existing mod that already partially performed the same purpose to add better functionality to it. I hate it when people wastefully compete when they should have checked their egos at the door and be collaborating instead. This version has solved the issue of the wrong potion being pulled from the bank. Yay! And turning off the Retrieve items from bank option solves duplicates being pulled. Double yay! Version 0.9.18 solved the crashing, none since it was released. I think that addresses all of the issues. I'll be doing daily writs with several characters this evening so it'll go through some more good tests. I'm very pleased with it doing Master writs as well, those were a real pain. Looking really good, thank you for the addons & all the fixes & enhancements! Ultimately the solution is to just pick one OR use both and deal with the consequences! 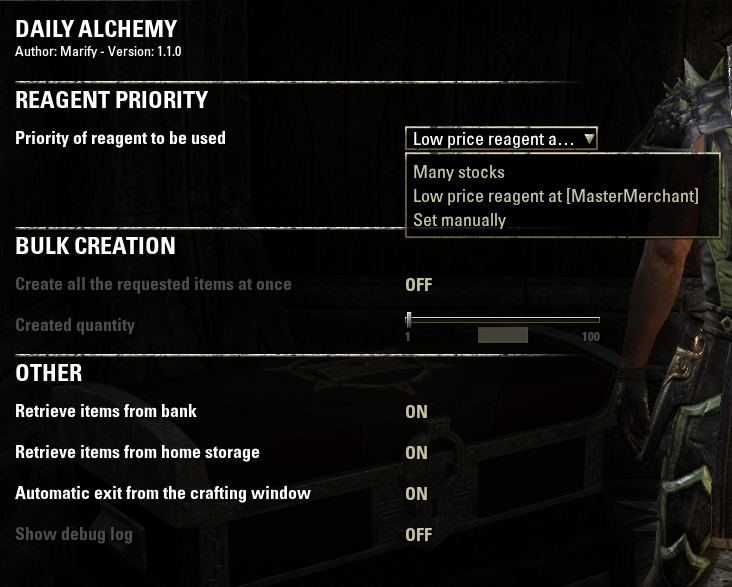 Dolgubon's doesn't craft the potion if I don't have it already, so I'll keep Daily Alchemy for that reason alone. That just means that I have to deal with the extra pot in the inventory, assuming Marify isn't able to resolve the issue. Dealing with the extra pot is much preferred over having to manually craft it. AND, after I use up all those extra pots in the bank that each character was carrying for writs, then it should mostly just craft all the time. Only my lvl 10 crafter that makes 4 pots (or 16 poisons) at a time will have extras, gotta deal with that no matter what. 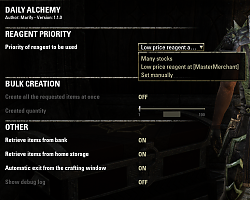 I could turn off Alchemy in Dolgubon's addon, but then I would need to manually pull the Alchemy writ every day. I'd rather deal with the extra pots! Here's another thought that popped into my overactive brain: Daily Provisioning doesn't duplicate the food/drink items that are pulled from the bank, why doesn't it? Maybe it's all a timing issue when the 2 addons are doing their thing at the moment the bank is opened? Anyway, not complaining, just providing more info for debugging for a fellow programmer. The more info you have the easier it is to figure out where the issue is & take care of it. Since the same function is operating, Please try one of the following. A: Try turning OFF the following setting of [Daily Alchemy]. 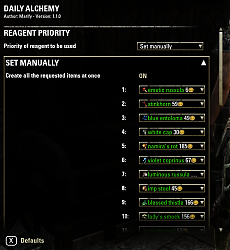 SETTING > Addons > Daily Alchemy > OTHER > Retieve item from bank. B: Try turning OFF the following setting of [Writ Crafter]. There seems to be another cause yet so check it. Hmm ,,, do you still crash the system? Because it is not reproduced on my PC, investigation is difficult. Excuse me, until I find a problem, Could you turn off the bad companion add-on? Is this addon supposed to install into the root of the Addons folder? As opposed to a subfolder named for the addon? It is installed in the following position on my PC. It becomes a place different from the installation folder of the game. The installation folder of my game is here. With today's update, we added an alarm function. However, There were bugs in the game, and it was not possible to correspond to some irregular cases. Although the request is supposed to be incomplete it will be handled as [completed] and instructed to report. When moving the map, it returns to [Not completed]. Last edited by VulcanTourist : 04/06/18 at 04:54 PM. So, Dolgubon's pulled the correct one & I was left with the Sip after turning in the Writ. The cause of this bug is the part that I found just yesterday. The add-on examines [item ID] and extracts the potion from the bank. However, only the potions are of the same type, the [Item ID] is the same.